This place is a class act! Best optometrist I’ve ever known. He really took the time to go over things and explain everything. Dr. Bresnahan spent more time on my eye health than anyone I’ve seen in the past. His staff went the extra mile to help me pick out frames. And the doctor is great at cracking a few jokes to make you lighten up! I’ll be recommending him to family and friends. The choice is clear – Burleson Eye Care. Rochelle is amazing. She went above and beyond to help my daughter get into the glasses she wanted even though they didn’t have the exact pair in stock. She put in the order right away and checked in with me along the way. Customer service is GREAT from everyone. 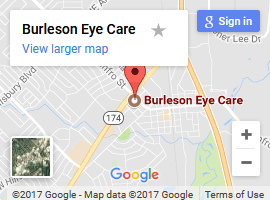 I would suggest anyone needing an appointment or glasses to head to Burleson Eye Care!! Everyone there is friendly and knowledgeable. We’ve gone there for checkups & glasses 2 yrs. now and it’s been a quick, efficient process. We’ve had no problems with repairs or replacements, either. They were excellent with both my kids. We arrived early. The service was great. Staff was polite and happy. Service was quick and accurate. We got glasses they were ready in a timely manner. The doctor was really nice and the kids loved him. Dr. B is hands down the best…I have had an unusual eye problem for years that so many Optometrists have problems with and he takes it in stride. I first saw him when he was at the Parks Mall. He makes every visit a pleasure and really knows his profession. You’d be hard pressed to find better and his personality is quite fun.